Living in a converted garage means that there are really only two rooms in the space. Our kitchen, dining room and lounge is one big open plan area. So, with Cindy relaxing on the couch, she really was sitting quite close to the kitchen. Dave had come home and was helping me prepare supper and Cindy asked us if we ever fought? Dave, with his wry, dry sense of humour told Cindy that I shout at him all the time. In reality, we don’t fight. Cindy was watching us cook in unison – discussing what needed to be done and how best to do it. A typical evening in our home. In some instances, this question could have resulted in all sorts of sticky situations. But, for us it is easy – there is really nothing to argue about. I pan fried some ostrich fillets which I had lightly seasoned with salt and pepper – we like our meat rare so I did them for two minutes on each side. I then squeezed the juice of one clemengold into the pan – you can use clementines or mandarins – before removing the ostrich to allow the fillets to rest. I let the juice reduce until nice and sticky before pouring it over the ostrich. Wonderful, Tandy!! But I still don’t receive any updates,although (I think) I am a subscriber to your blog?!! I don’t recall ever seeing emu on a menu in Australia, have you ever tried kangaroo? I’ve never eaten ostrich (scares me a bit, not too sure why), but you make it look pretty dang delicious! I doubt I could even find it in the markets here though. some ingredients we are not familiar with tend to have that tendency! wow.. cannot say I’ve ever had ostrich, or even seen it available by me! How fascinating…and love your relationship cooking with Dave!! Have only tried ostrich once in London and I loved it – this looks delicious. And we have a kitchen/dining room/living room all in one – through choice. Works for us, like one big family room! Seeing your ostrich recipes is always so interesting–it seems like such an exotic food! Oh to have easy access to ostrich! that is what I say about most of the foods you get! Sounds interesting – does that solve the problem of fillets being rather dry and tough? There have only been a few occasions where I have found ostrich prepared in a way that doesn’t simply leave it as a dish inferior to other poultry. Pete and I generally don’t share the kitchen – its either one of us in there alone. 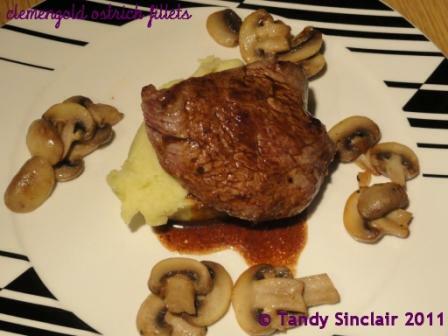 Fabulous quick easy and mouthwatering supper Tandy. Sounds good, but ostriches are scarce on the ground in the Vendee!